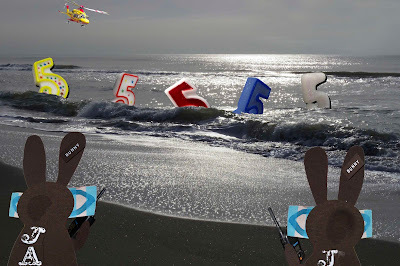 The Wabbit and his opposite watched the sea because Wabsworth advised the Fifth Force would arrive that way. Waves crashed relentlessly as the tide washed the beach. "The Mediterranean doesn't have tides," said the Wabbit. "The tides are too small to mention," said the other. "Just a few feet," complained the Wabbit as water soaked his fur. "Maybe there's a wind," said the other. But there wasn't a breath of wind. Suddenly a breaker rose in the air and hung for a moment. "It's a clean up set," grinned the Wabbit but his humour didn't last long. A massive Five reared from the breaker. Then another. Then another until there were five Fives. The Wabbit's radio crackled and he looked up. The chattering of a helichopper joined the crashing of the breakers. Water and sand lashed across the Fives and made a curious rasping sound as one by one they vanished and reappeared like flashing Christmas lights. The radio crackled with the voices of two Lapinettes. Together were crystal. "We have visual, stand by." Water rose around the Wabbits' feet. The Wabbit spoke urgently into the radio. "We'll be floating by if we stand here much longer." "Copy that." said the Lapinettes. "But maintain your positions. The Fives have no interest in you." The Fives rose and dropped as the tide became stronger. Sea washed around the Wabbits' waists as they held on - until in an instant, the Fives became dark and merged with the waves. The helichopper drew closer and the noise was deafening. Four eyes stared down from the cabin. "Helichoppers," murmured the Wabbit. "They make so much din, the earth pushes them away." "That's how they stay up," said the other. Background photograph credit: Camilla Galli da Bino.